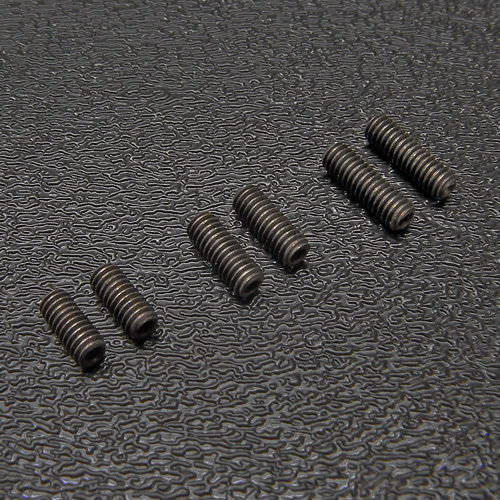 Black alloy steel bridge saddle height adjustment screws for 2008 and newer American Standard Stratocaster® as well as the 2017 American Professional Stratocaster® that use the fine thread #4-48 saddle height adjustment screws. Typically Fender has used the #4-40 saddle height set screws on the Strat since 1954, so before ordering make sure to determine the correct thread size on your particular guitar before ordering. Uses the 0.050" adjusting hex wrench which is available here. These little screws are the most often lost screws on any Strat. Lengths: 1/4", 5/16" or 3/8". Most common setups are to use shorter length saddle height screws on the little E and big E string saddles with the in-between saddles B, G, D & A using the next size larger. Exactly which saddle height screws you use on your two outer E string saddles all depends on your particular guitar setup. The reason for the 3 different lengths for these saddle height adjustment screws is so that you can set the radius of the saddles to closely approximate the radius of your fret board without having excessive length of the set screws protruding above the saddles causing your hand to get caught on while playing. You'll want to keep the excess height of these above the saddle as short or flush as possible. Sold in packages of 12 of each selected length. Saddle height screws are sold in packs of 12 of each selected length. Available in three lengths: 1/4", 5/16" and 3/8". Black alloy steel #4-48 machine screw threading.